I know I sound like “old tapes” but seriously, where has the time gone between Hallowe’en and today?! It’s Friday! It’s been 2 weeks since Team A’s last reveal for ScrapMuch?, and it’s time for some new sketch-y inspiration to jumpstart your creativity this weekend! Supplies used: Cardstock-Stampin’ UP! ; Patterned paper-Lawn Fawn; Twine-Stampin’ UP! ; Sequins-Teresa Collins; Sewing machine-Janome; Thickers-American Crafts; Ribbon and plain blue circles-Tiffany!! ; Ink-Tim Holtz Distress; Mist-Mister Huey’s; Journaling pen-Stampin’ UP! ; Punches-Ek Success and Stampin’ UP! I admit this sketch was a bit of a challenge for the very linear me! My clean and simple ways will generally try to straighten out lines, but I didn’t really want a filmstrip look for this either. I also moved the journaling onto a card and used the other space for embellies. I compensated for my struggles with the whimsy placement of photos by sticking to a very monochromatic palette, appropriately the Tiffany colours. The plain blue circles on the layout are actually punched out of the Tiffany bag, and the ribbon is the ribbon from the box. When I travel I tend to collect a lot of “stuff” and ephemera and generally find a way to scrapbook it or use it in my mini albums or pocket pages. I know I still haven’t blogged about my Vegas trip nor Inspiration Unlimited yet, but I am slowly scrapping and sharing some memories in these reveals. This page is from my Vegas trip as well. On my last night there, I decided I was going to leave Las Vegas a winner. Let’s face it, going home with pretty jewelry is pretty much hitting the jackpot amirite?!? I had been coveting some Tiffany earrings for a while and pretty things make me happy. Since there was a Tiffany in The Shops At Crystals that was attached to Aria where I was staying, it would just be wrong of me to not go there and get them!! They went on my ears when I got home the next day, and I haven’t taken them off since! I would love for you to hop on over to the ScrapMuch? blog and see what the rest of Team A has created for your inspiration! Little hint? There are are some pretty darn amazing layouts for you to see! And of course, as always, I would love to see what you create! Here is a run down of our Sketch-y Friday rules. Just link up your creations in our sidebar to be entered into a random draw for our monthly prize. You have until November 29th, at midnight to participate in any of November’s sketch challenges, each linkup tool will remain open until that date! I would never have known that you struggled with this layout! Love the colours and the embellies! Great jog! 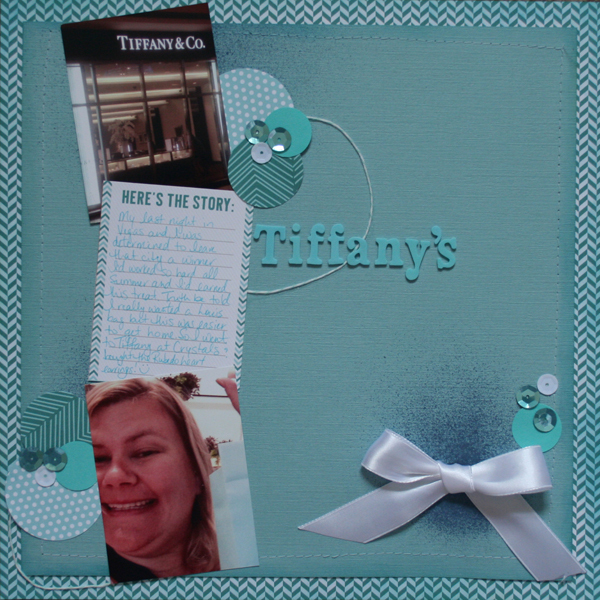 Gorgeous, love that Tiffany blue, the up-cycling and the great addition of journalling.